Lately there has been a lot of talk about diversity in the sf community. Not just ethnic and racial diversity but also about representing people who are not neurotypical in fiction. There has of course also been a lot of talk about better representation of gender and sexuality. 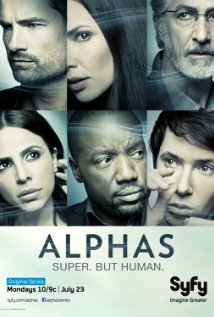 But what I want to talk about today is the representation of non-neurotypical individuals in the tv-series Alphas on the Syfy channel. I want to talk about a series that I think is doing it right. Because I think it is more important to talk about those who are moving in the right direction, that to only focus on the ones that are still going the wrong way. I have just discovered the series this week on Netflix. We have just finished watching the first season. Long live Hola so I can watch the american selection on Netflix instead of just the meager selection on the danish version.